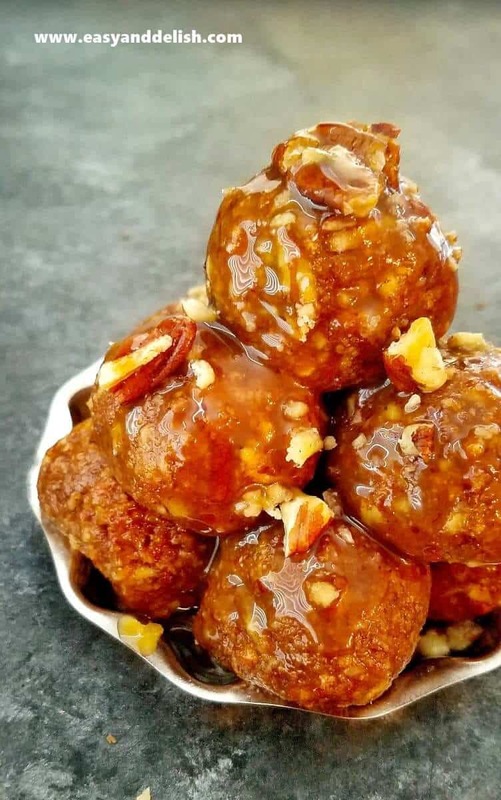 These No Bake Pecan Pie Cookie Balls are quick to make and require no special skills. They are perfect for celebrating Thanksgiving without all the time and fuss of preparing a traditional pecan pie. Pecan pie? I am a huge fan… well how about in the form of cookies? 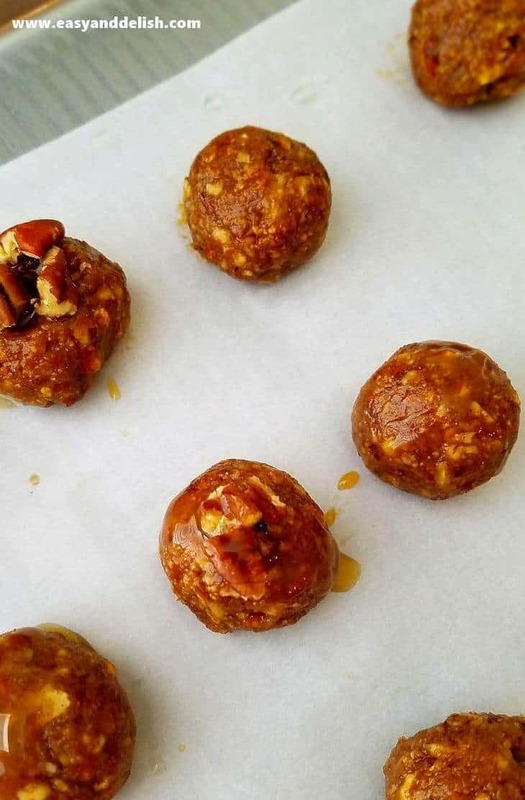 I hope just the very idea makes your mouth water, because No Bake Pecan Pie Cookie Balls is the treat recipe that I would like to share with you this week. I’m telling ya, it is the perfect dessert to please both children and adults without putting in too much effort. My sincere advice is make them for your Thanksgiving feast, along with the best sweet potato pie ever or our marbled coconut pumpkin pie. They will be a party at your table and a party in your mouth! These cookies are quite easy to make, demanding neither special cooking skills nor chilling/baking time. All we have to do is mix chopped toasted pecans, cookie crumbs, caramel sauce, light brown sugar, vanilla extract, and water in a bowl until obtaining a homogeneous mixture. Wet hands and roll into balls using a tablespoon as measurement. Then, place them onto a baking sheet lined with parchment paper and refrigerate until ready to serve. Right before serving, drizzle a bit of caramel sauce on top and garnish with either a whole pecan or chopped pecans. Voila! 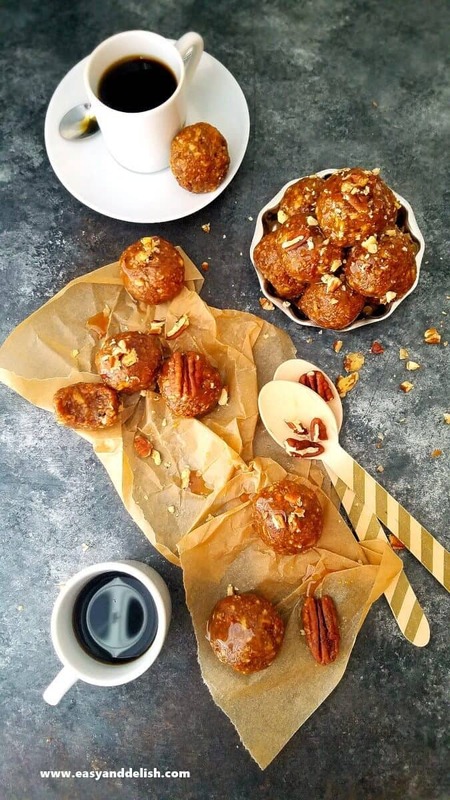 One of the most simple yet festive treats, they will be the talk of your holiday party — without all the work required to make baked cookies or a traditional pecan pie. Don’t you love this type of recipe? Yep…me too! 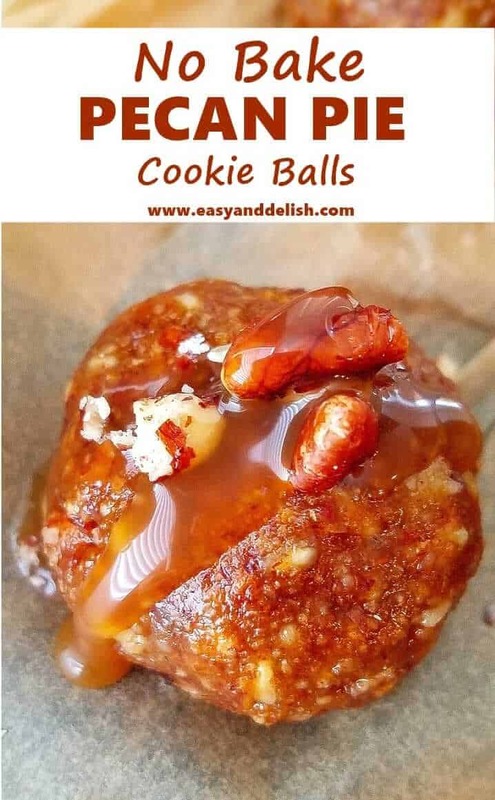 If you prefer to have these Pecan Pie Cookie Balls for no special reason at all, I won’t blame you. Pair with a cup of coffee or tea while leafing through one of your favorite cooking magazines or gazing at the stars — and have some marvelous ‘me time’! 😉 They are great for any time of the year! But of course desserts are not the only thing we have for you on Thanksgiving. Breakfast, turkey, side dishes, drinks, and other desserts, too… for more inspirations, click on these 35 Thanksgiving recipes and we’ll have lots of amazing dishes to celebrate your Thanksgiving and delight your guests. If you are having a party for two or a small gathering, or don’t want to spend hours roasting a turkey, make our Apple Glaze Cornish Hen with Toasted Herb Dressing and save time and energy. You won’t even have to worry about the infamous leftovers. Because we live far away from our families, my family and I usually spend Thanksgiving with great friends. But this year, we will be reunited with family. The girls are thrilled to see their grandparents and make memories with them. How about you? No matter how you intend to celebrate this holiday, I would like to say that I am grateful for you and you and your support. In a large bowl, mix all the ingredients until obtaining a homogeneous mixture. Use your hand to mix! Then, roll into balls using a tablespoon as measurement to obtain balls of uniform size. Wet your hands with water to make rolling easier. 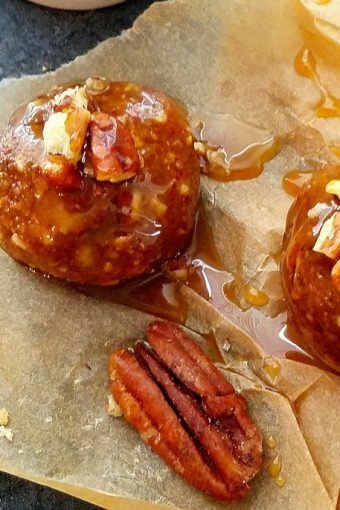 Place pecan pie cookie balls onto a baking sheet lined with parchment paper and refrigerate until ready to serve. Right before serving, drizzle top with a bit of caramel sauce and garnish with either chopped pecans or a whole pecan. Enjoy! Store leftovers in a covered airtight container in the refrigerator. Oh my! I adore anything with pecans! 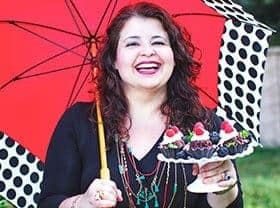 I’m so ready to start making holiday treats, this recipe is a great way to begin the season. Me too Deb! Wishing you a very Happy Thanksgiving! I have made pecan pie in the form of a smoothie, but never a cookie ball! This sounds so good! You won’t regret to try it. They are really delish!